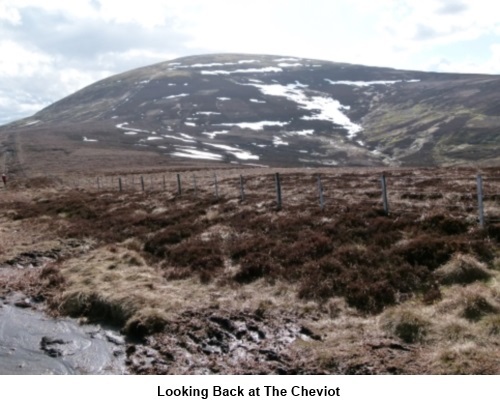 Introduction: The Cheviot walk takes you to the highest point in Northumberland, at 2674 ft (815 m). 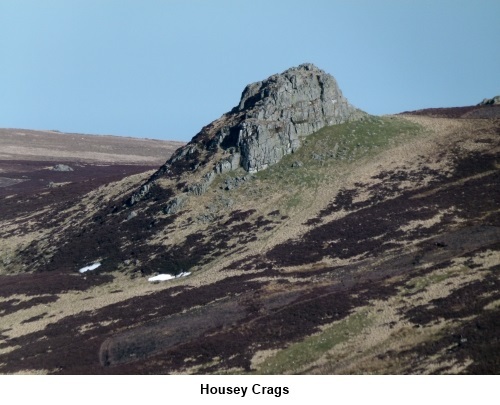 This is a remote hill and it is likely that outside of holiday periods/weekends that you will see few people on this route. 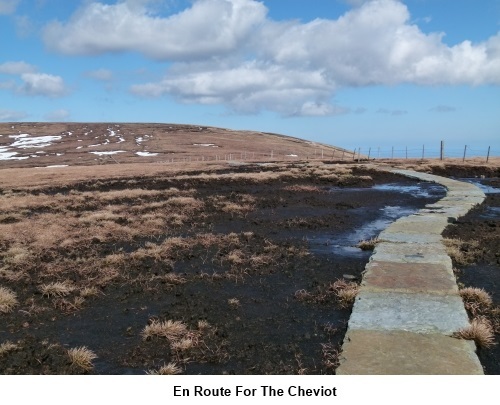 The Cheviot is however on the Pennine Way, so you may encounter some long distance walkers on one section. 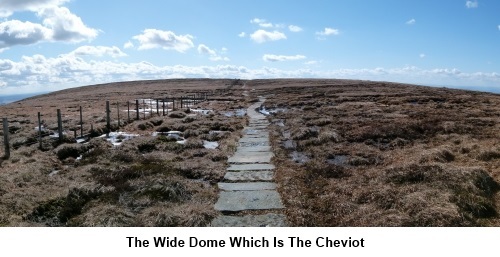 The Cheviot itself is a wide dome of a hill, which boasts what must be one of the ugliest trig. points in the country! Its flat summit means that from the summit itself, the views are not special. 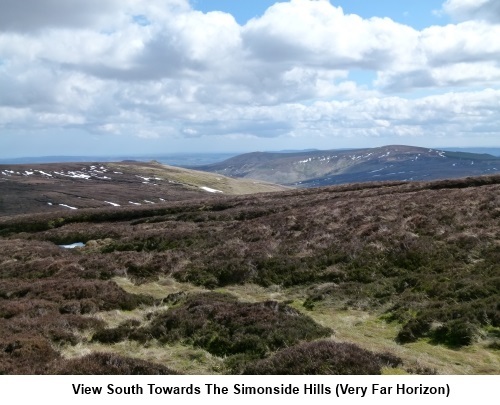 However, the views on both the ways up and down are spectacular, stretching to the North Sea, over the Simonside Hills and to Cumbria. The approach walk along the pretty valley of the Harthope Burn is lovely as indeed is the drive to the start. From a navigational point of view, the walk is straightforward and various aspects (stream, fences and “manicured” paved paths) mean you would struggle to get lost, even in thick mist. These are detailed below. Getting to the starting point at Langleeford is something of an adventure in itself due to the remote nature of the valley. In my view the most assured car route is via Wooler. 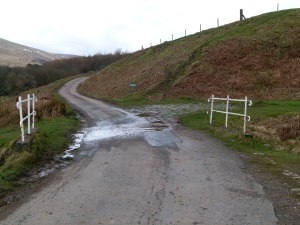 I say this because although there is an (unsigned) approach from the A 697 at NU 019242, just south of Wooler, this involves crossing a ford at Happy Valley (NT997249). I went this way after heavy rain and the ford was in serious spate and over a foot deep. 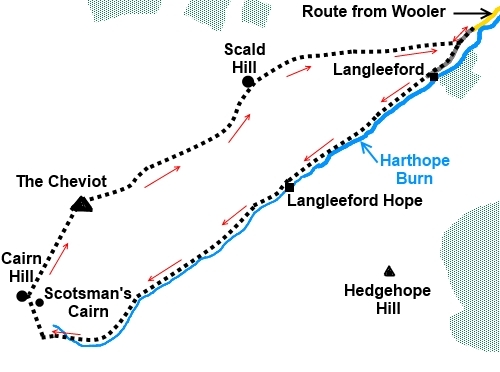 To get there via Wooler, take the first left into the town (assuming travelling north on the A697) and turn left on to Cheviot Street by the Anchor pub. After that, just follow the signs for Langleeford. A long, single track, dead end road eventually takes you into the valley. Keep going, until you reach a white railed bridge (see picture). 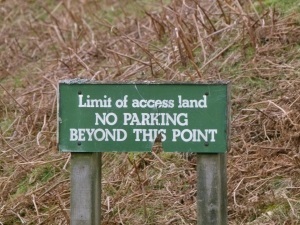 There is a notice warning you that there is no parking further on. Just before the bridge, are various places where you can park (free). This is a definite gaiters walk as it can be very, very boggy! There are no refreshment opportunities en route other than what you bring yourself. 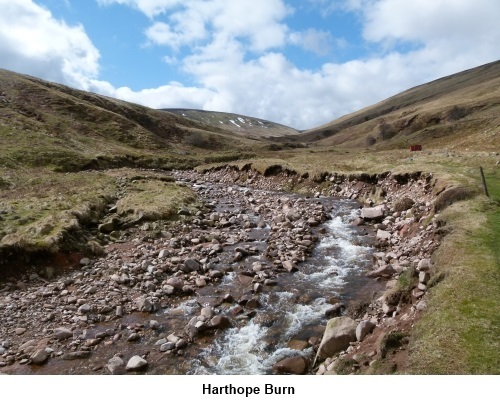 There is one very steep section at the end of the Harthope Burn valley (hence the red traffic light) and the descent from The Cheviot earns amber on account of its seemingly never ending continuous nature. Some might prefer to do this walk in reverse but I prefer the less steep (if longer) descent as I find it kinder on the knees. Start: From the parking just before the bridge (NT 953225), cross the bridge and walk along the tarmac farm drive. At Langleeford Farm, the track splits, the left hand arm going to the farm. Keep straight ahead through the walkers’ gate marked with a yellow arrow. 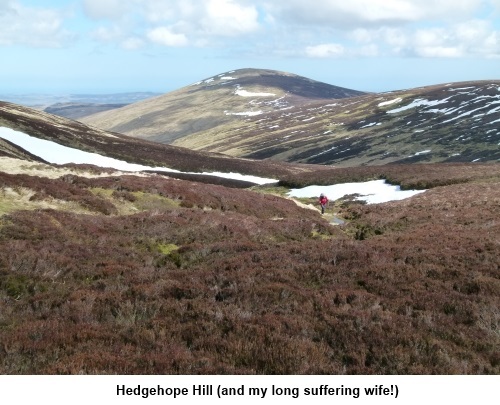 Ignore a path to the right signposted for Scald Hill and The Cheviot and continue to follow the path alongside Harthope Burn. This instruction is all you need for the next 3 miles or so. 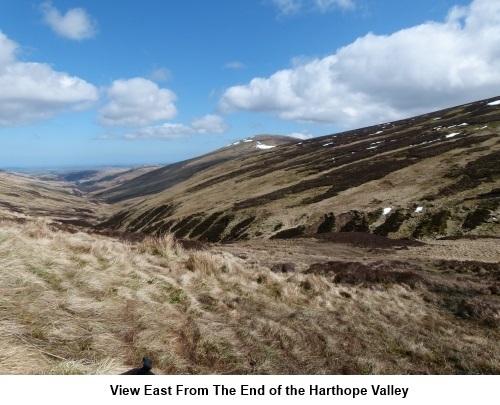 The Harthope Burn valley is very attractive and as you get higher, there are good views east. Continue to follow the Burn as it climbs. Do not worry too much if you think you have lost the path at any point. Head initially for the ‘V’ shaped notch at the head of the valley,then as Burn/path eventually bend right (west), head for the fence visible on the skyline ahead. You should reach the fence at a stile (NT 905190) (which you do not cross) but It does not matter too much at which point you reach the fence as once you reach it, simply turn right to follow it to the higher ridge. This is the steepest part of the climb which earns it the red traffic light. You arrive at Cairn Hill on the wide ridge, by Scotsman’s Cairn (more like a circular shelter). Cross the stile ahead to join the paved path which is part of the Pennine Way and turn right (NT 903195). 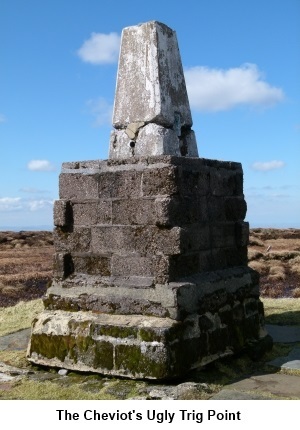 A finger post confirms The Cheviot summit is ¾ mile. Follow the paved path to the trig. point (NT 909205) and beyond. 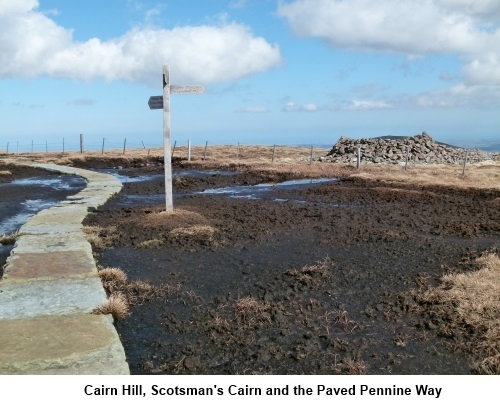 You cannot really go wrong here unless snow is obscuring the paving – in which case the route is 32° magnetic from the cairn and 69° magnetic from the trig. point. 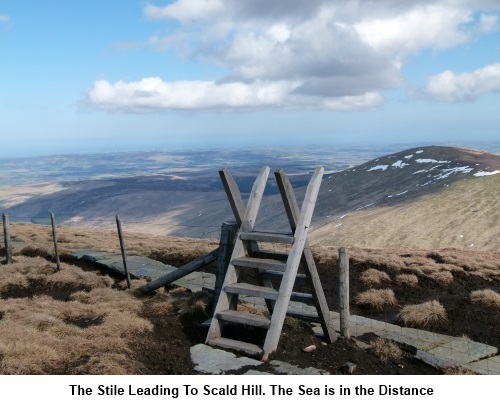 When you come to a ladder stile, cross it and begin your descent to Scald Hill, following the fence on your left. You will notice some quite large cairns on the other side of the fence which might make you think you are on the wrong side. However, the route is to the right of the fence as will become obvious further down. When a fence crosses your path, go over the stile and continue to follow the fence on the left. Do not turn right along the grassy track. Keep following the fence until it turns left. There is a gate at the corner. Turn right here, indicated by a post stuck in the peat (NT 933221). In practice, the path actually forks right a few yards before this. The route now descends past a series of grouse buts on the right. The footpath proper is actually a few yards to the left but the path/track by the butts is less boggy! They join up anyway just before a stile. 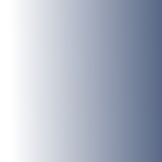 Cross this and keep straight ahead on the obvious track. When you reach the corner of a wood, go down its left hand side and at the road, turn left back to the parking.